2011.10.27 ショックは問題なし! ウユニへ再び! / No problem with the shock absorber! Came to Uyuni, again! 2011.10.25 Wilbers装着。問題解決か? / Installed the Wilbers. I got ready by 9am, but when I went outside, I met the guy from Hodaka Mountain Tour Co. He said there would be 3 Japanese girls (including Ohagi) joining his tour (from 10:30am) today, so he suggested me to follow the tour. 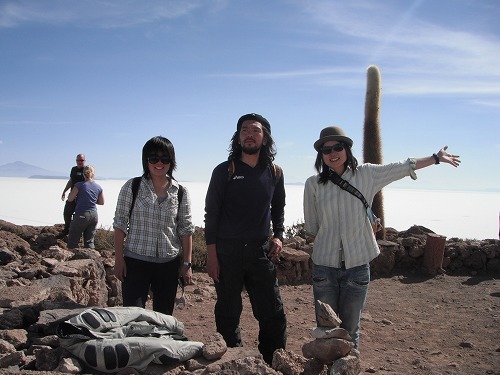 The member of the tour were, 3 Japanee girls Ohagi, Rika, and Yasumi, 2 Argentinians (a couple), and 2 Spanish girls. We went to the cemetary of the locomotives. I came here with the tour 2 months ago, but coming with own bike, was priceless. I took a photo with Ohagi. Then we headed to Village of Colchani. There was a 20km of dirt road to get there. There were bad currugation in some secions. I followed the Landcruiser around 70-80km/h. It was very dusty riding behind the car!! At Colchani, we stopped for a break. Some member of the tour went for a shopping. My GS was drowing all the attentions of other tourists!! 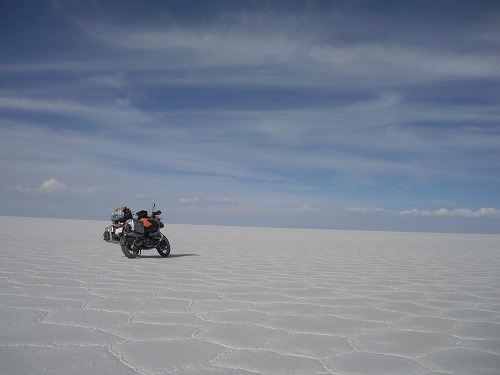 THen we entered the salt flat. The edge of the salt flat would be always wet, but it was not as wet as 2 months ago. But there were some wet spot and pot holes filled with salt water, so I rode slowly and carefully not to splash salt water to my GS. Then we came to the dry surface of the flat. We drove to the "Salt Hotel". Every where was white. 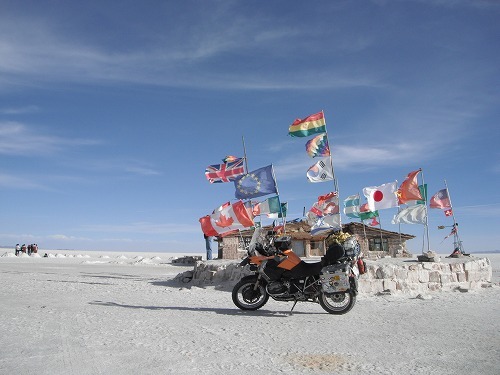 It was exceptional feeling riding on the salt flat with own GS!! 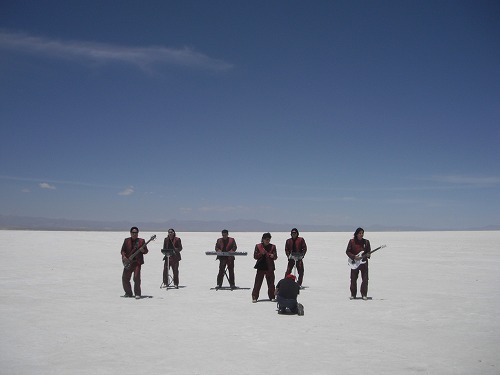 At the salt hotel, a Bolivian band was making their PV. Many tourists came to chat with me. Rika will stay a night at the salt hotel, so we said good-bye to her there. Then we headed to "Isla de Pescado (Fish Island). 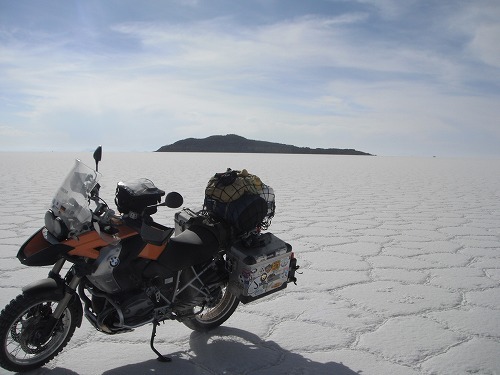 As we rode to the middle of the salt flat, the hexagonal salt cristal became more clear and more beautiful. 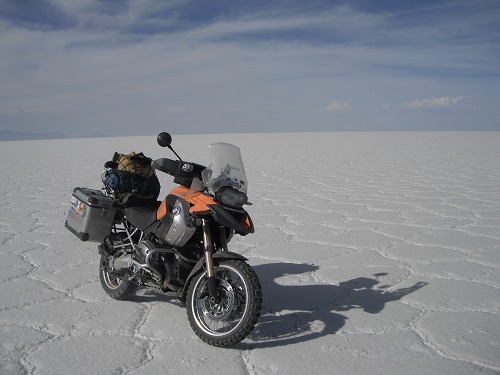 I was glad that I made it to the salt flat on my GS, really. I did see nothing but salt for a while, but gradually I started to see Fish Island on the horizon. It looked like "Fish" a little bit. From the hotel, it took about 1 hour to get to the island. It was around 2pm. There we had lunch. I had some biscuits, and I was having them as lunch. But Walter offered me lunch! I did not pay for the tour though. Thanks, Walter!! Then we went to walk on the island. 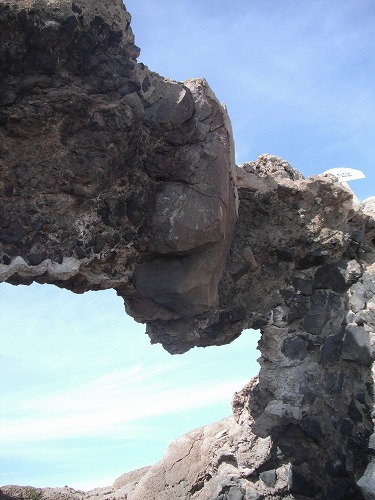 The island itself was made with fossilised coral. There used to be under the sea. The continental plates of Pacific and South America corrided, and South American continent was lifted up - that created Andes. When the sea bed was lifted, sea water was trapped inland. 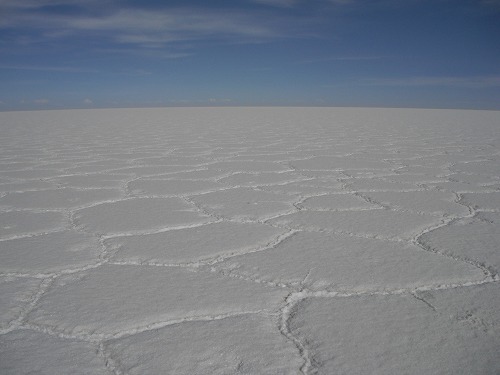 Gradually it dried up and became "Salar de Uyuni", and there are 5 island like Fish island on the slat flat. Very interesting. Now the fossilised coral island is covered by cacutus. There was a sign saying one of the cactus would be as old as 900 years! I did not know cacuti could live that long. After waking around the island, I said good-bye to the tour. They were heading to the north to Volcano. 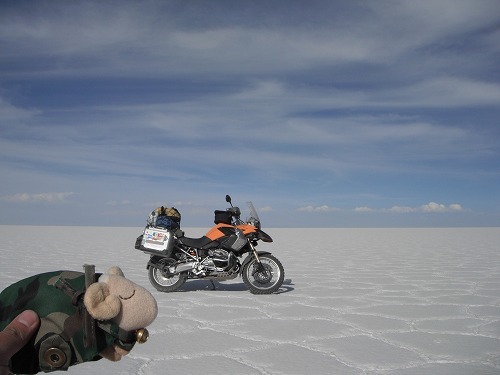 But the part of the salt flat would be more wet, and I had been there with the tour before. So I head back to Colchani. 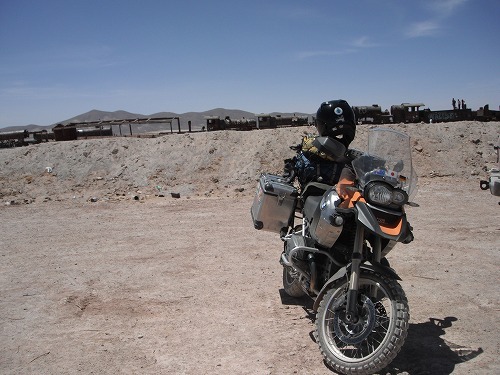 On the way back, I took many photos of my GS on the salt flat. Mr. Sheep was also happy to be on the flat again. 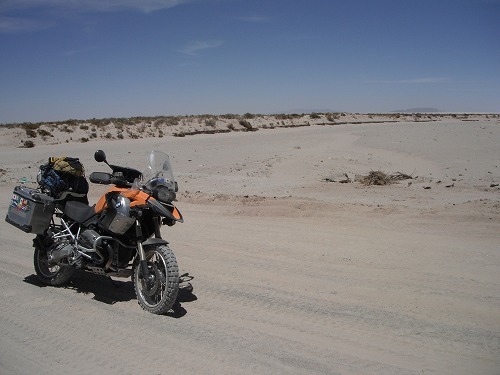 From Colchani to Uyuni, I rode on the dirt again. This time I was alone, so I was riding faster. I came back to Uyuni around 5:30pm. As soonas I got there, I went to a car washing place to wash off salt from my GS. It cost me 20Bs (expensive!) but I should do it. Then I found out the rear mud guard was broken. On bolt was missing and the plastic was broken off!! 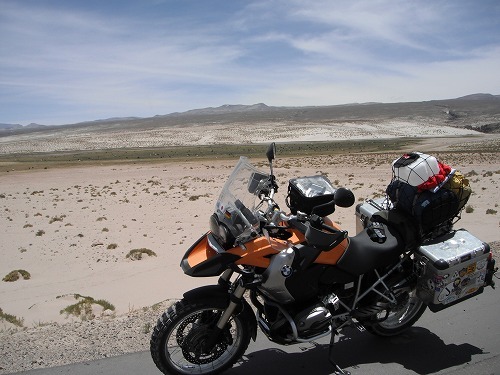 I was not sure if it could be fixed, but anyway I would keep the mud gurad until Tucuman, Argentina (next BMW stop) to see if I could fix it. Now my GS was clean. I went to a petrol station to fill up (filled up a jerry-can as well). I checked-in at Hotel Aveida again. When I was wiping my GS (to make sure I get rid of all salt from her), Ohagi came back. We went for dinner and had chat till 9:30pm. She would be heading to Chile as well and would be in San Pedro de Atacama by Sunday. So we sould be able to catch up there. Tomorrow I am heading to Calama, Chile. Bye-bye to Bolivia!! ショックは問題なし! ウユニへ再び! / No problem with the shock absorber! Came to Uyuni, again! I left the hostel around 8:15am. 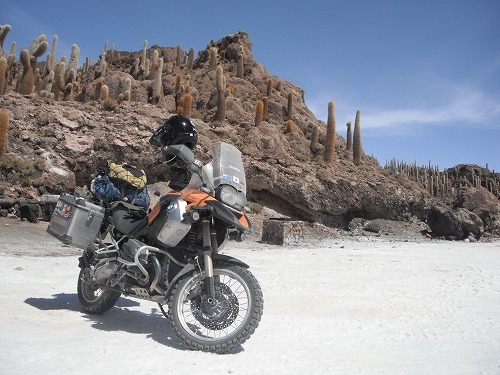 Until Potosi, I stopped many times to check the shock absorber. Firstly I could see oil on the rod of the shock (I wiped it off every time), but gradually there was less oil could be seen on the rod. I arrived Potosi around 10am. And there was no oil on the rod! So as Carlos said, oil was remaining from the factory. 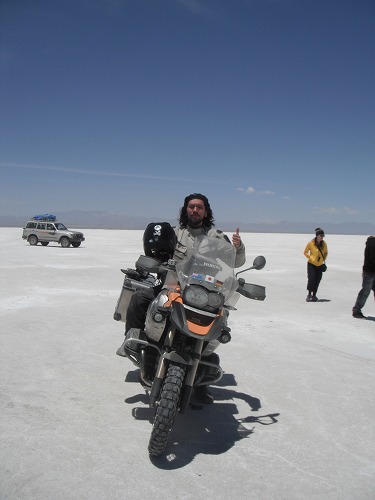 I decided to go to Uyuni as the shock is fine. 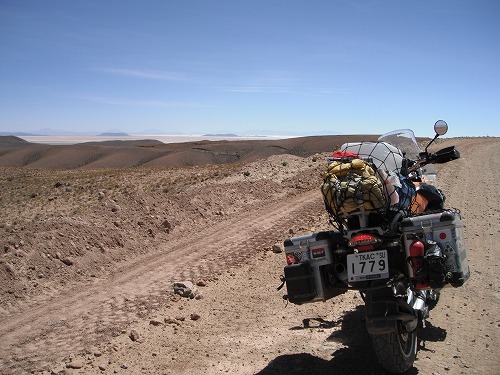 The road to Uyuni was almost paved, but there were places under constructions, so I had to ride on dirt. There were several bridges left half way constructed. I wondered why they did t complete those bridges? IF they were completed, there would be smoother traffic. 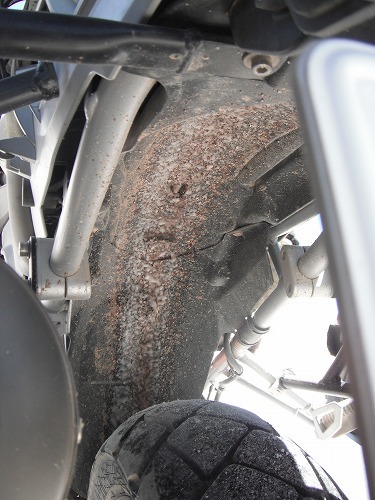 Even after rode on dirt, there was no oil coming out from the shock. Good. I got to Uyubi around 2:30pm. 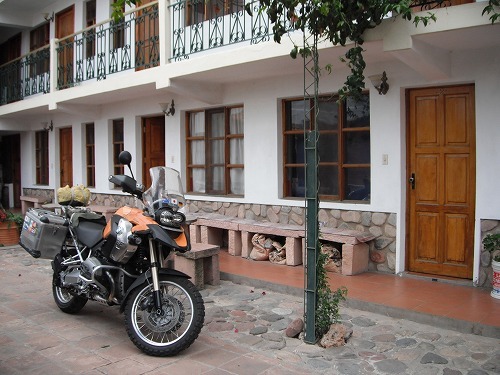 I checked in at "Hostal Avenida", there another Orange GS was parked (with Chilean number plate). 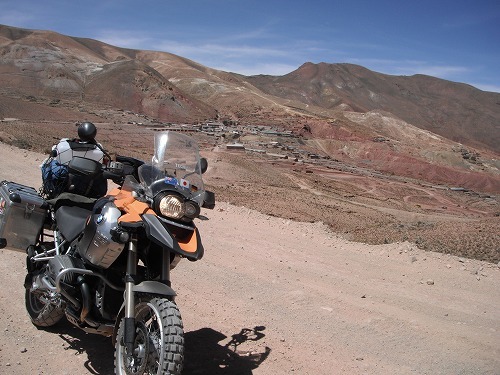 Also there were 1 Africa Twin and 1 Trans Alp. I have not met the riders, but I am looking forward seeing them this evening and talking with them. When I was just about to go for dinner, I met a Japanese girl. 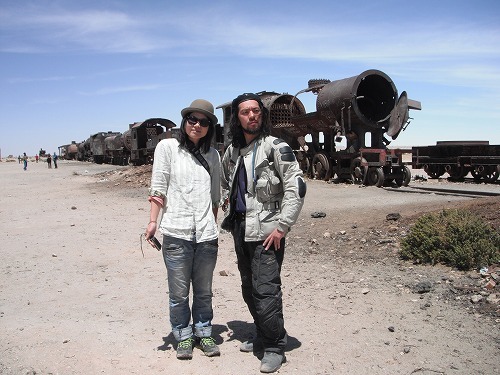 She was Ohagi from Osaka, travelling around South Ameriva for 3 months. 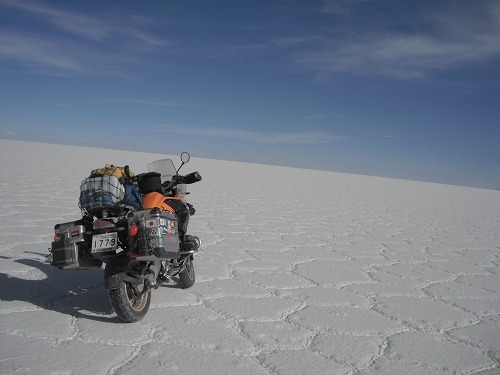 She will go to Salar de Uyuni tomorrow with a 4x4 tour, so we might catch up there. Tomorrow I will go to Salar and spend a night there camping. Its gonna be fun! This morning I saw of Mika. As he has to get back to Salta by 8th of Nov, he has to keep going. He said he might go to Horizons Unlimited meeting in the begining of December in Argentina, so we can cacth up there. Tlil then, buen viaje!! I went to buy a few tihngs in the supermarketand started to pack up stuffs. Now I am ready for an adventure. In the afternoon, I went to the school to day good-bye to teachers. Now I had done everything in Sucre. 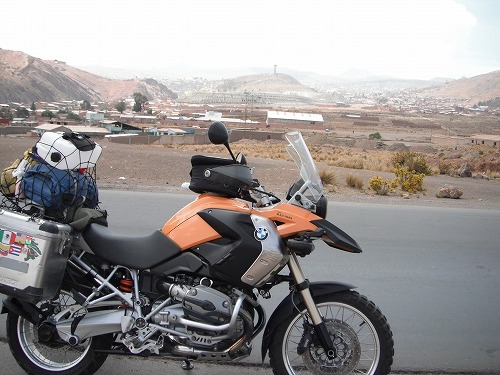 Tomorrow I will ride to Potosi first and se if the shock is fine or not. THen I will go toTupza. Abad news is that there may be a road closure in Potosi tomorrow (due to a demonstration). Wish me luck! Wilbers装着。問題解決か? / Installed the Wilbers. The bus arrived Potosi at 5am. It was really cold night. I woke up every 1 hour... tired. At the bus terminal, I had to find a bus to Sucre. Luckily I could the last seat for 6am bus! 17Bs. The bus left at 5:45m as everyone was on board. The bus got to the fringe of Sucre by 8am, but it took long time to get to the bus terminal from there. 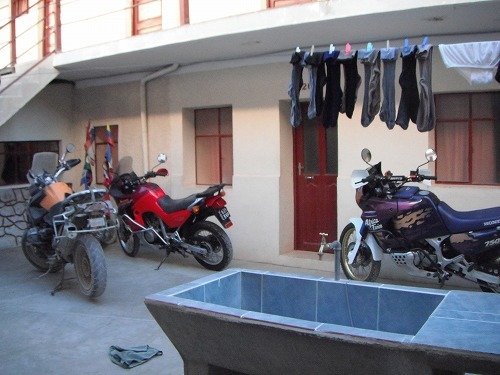 Arrived at the bus terminal around 8:30am and walked to "Hostal Pachamama" the place to be in Sucre. Luckily a private room was available, so I took out all the luggage from the storage and got ready to visit "Motoservi" to install the Wilbers shock. I got to "Motoservi" around 10am. Jaime was not there (he is teaching at a school every monday morning), so Jimmy and I started to install the Wilbers shock to my GS. We fiished the installation around 10:30am. 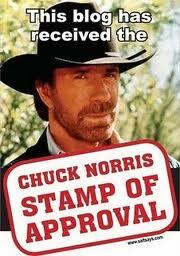 As my visa and permission of the motorcycle is running out, even though oil is leaving from the shock (? 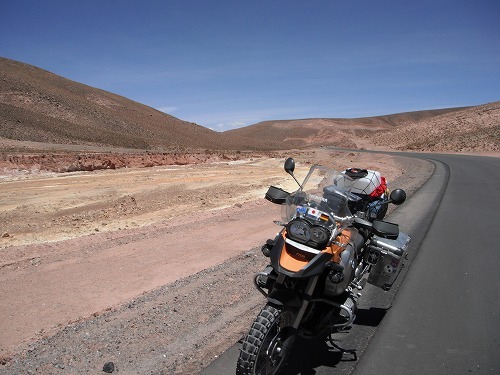 ), I have to ride to Santiago to fix it. Anyway I will contact Carlos @ Santiago to ask his opinion on this. I went back to "Motoservi" and talked to Jaime. Jaime did not charge me at all! He had done so many things for me, but he did not charge me. How kind he is!! Thank you so much. With Jaime, Jimy and Shan, we took photos, and I said good-bye to them. I will definitely come back to see them in the future (hopefully in 5 years). Back to the hostel, I sent an e-mail to Carlos. He replied to me immediately and saying it could be oil left from the factory. He suggested me to ride about 200kms and see if oil still on the rod. If yes, the oil seal failed. If not, there is no issue. 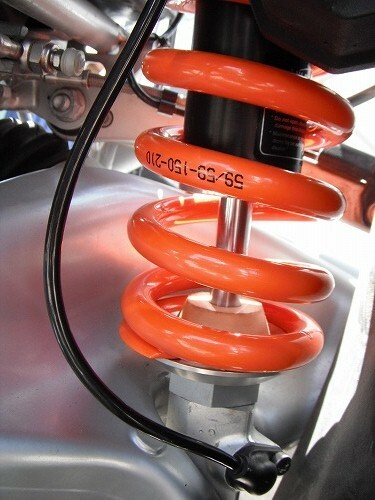 So at this moment, it is not certain if the new shock is good or bad. I went out for lunch. I dropped my laundry to a laudromat, and went to the immigration office. 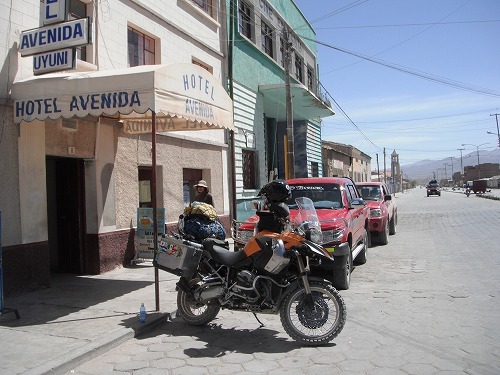 I asked if I could get more days to stay in Bolivia as until 28th of October would be too short. It took more than 1 hour to process, but I got the permision to stay until 7th of Novemember! 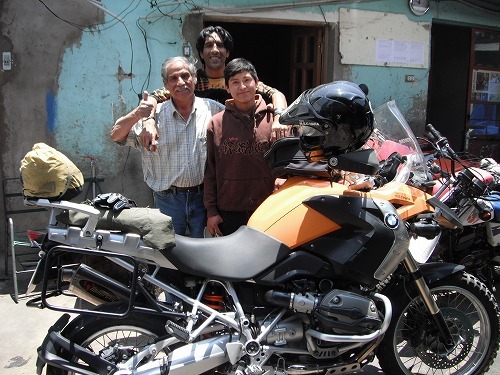 Anyway my temporary permit for the motorcycle will expire on 30th of October, I have to exit out of Bolivia before then. But now I have a little longer time, so no need to hurry. Back to the hostel and I took a rest. While writing diaries, I heard a motorcycle was coming in. I went out side and there was a Honda Africa Twin. He is Mika living in Salta, Argentina. 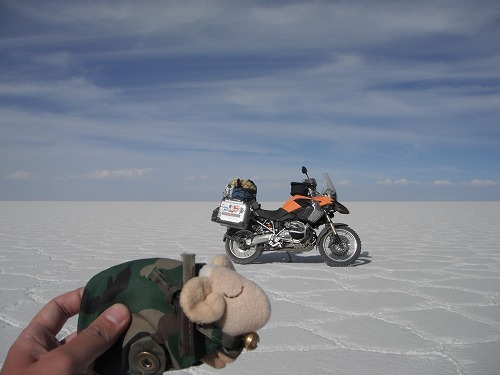 He took 3 weeks off and will ride around Bolivia. He went to Japan and joined WTN-J meeting!! What a small world. We talked till late.